A S D W or ARROW keys for direction movement / combat / tything at altars. E to go up stairs R to rest, space to rest 1 turn. R will automatically stop resting if any monsters are near so there's no danger in using it. Mouse click on coats and weapons in the HUD to equip them. Drag weapons and coats out of their boxes in the HUD to un-equip. You can't unequip the grey coat (or your hands) but you can get a new one and all coats wear down as they get hit providing less protection as the number gets lower. Weapons now wear down too. Stand beside or below (not above) grey altars to offer gold in exchange for experience points and weapons. These get better the higher up in the tomb you get. Don't donate to an altar if there's a monster above it because the monster will take the gold. Monsters can pick up gold. Monsters of your own color can't hurt you. You can swap coats as you get them by clicking on them with the mouse. Turn to a color that a monster hates, lead it into a room of hostile monsters, then turn back to that first monster's color. You can get opposing monsters together and they'll fight for you. You get experience for all monster-on-monster combat. If your color monsters get a kill you get full ep. 1/2 ep for all other monster kills. More violence on the level= faster level up for you! This means if you're wearing a yellow coat and a yellow monster kills something, you get the same EP as if you killed it. If a blue monster kills a red monster (for example) and you have some other color coat on, you get 1/2 EP. 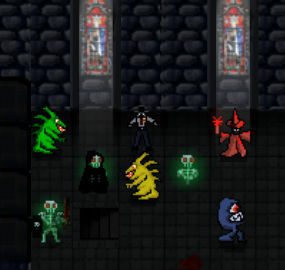 Turncoat Tomb is all about getting monsters to fight each other instead of you. Don't be too brave early on. Before you have any real weapons or coats you're pretty vulnerable to even the lowly chomp monsters. You should probably steer clear of undead if you're not armed well. The undead corpses of the tomb are tougher and more deadly than the rest of the monsters. Tything at colored tombs makes them hate whichever color you are wearing less. It's a good idea to turn to your grey coat and at some point make all the monsters less hateful toward grey. Never think a skeleton warrior or lich can't kill you in one or two turns. They often can. Hunters (the lizard like monsters) are very dangerous too. Treat them with care. The Red caster's fire attack sets you on fire for a few turns causing residual damage and will burn webs. The Green caster's poison attack does residual damage. Blue caster casts lightning which can damage you and other nearby creatures. Spider web damages you and holds you for a few turns. Once you're dead, the game reloads. Around the levels there are coats. When you get one you can switch to it and those monsters will leave you alone. 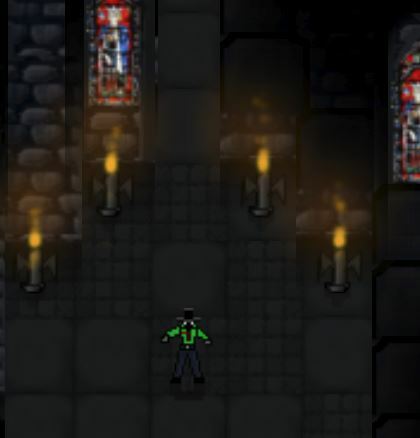 There are different colored altars that push out monsters. Grey altars give you weapons and health when you put gold in them. Other colored altars accept donations in exchange for that color hating you less. When you drop gold in them (10gp at a time) a number form 1-10 floats out indicating their animosity toward you (whatever color coat you're wearing). You can get rid of your weapons by dragging and dropping them from the hud. Keep getting better weapons they get better as you go up floors. The crypt altars will give you nothing but pain and they will always hate all life. But they'll take your gold anyhow and who knows? Maybe they will ask you join them. There's a slight chance you'll get the shadow coat which is awesome. Sometimes it's hard as... well it's a Roguelike that's for sure! Fixed major bug with Hold and zap spells. You now get ep no matter who kills whom. More if it's your color getting the kills. Weird teleport-switching places with spider when in web. Weird bug where it sometimes gives you a sword at the beginning? Left in. Lightning now strikes and splits to hit nearby creatures of the same color as the target. Adjusted 3D map rotate effect so zorder works no matter what the layout orientation. 3d spin effect (can spin with middle button) I'll be working more on this but it's just to give it a more unique look. Tilts depending on what side of the dungeon you're on. 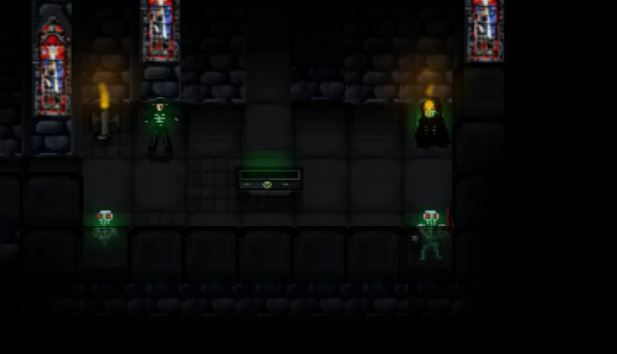 Fire, electricity, poison, life drain, web, and critical hit (for swords) effects added and implemented including interactions with each other. More balance tweaks. Monsters now can hit you (basically a natural 20) even if the AC is above their to hit. Some are nerfed a bit. updated hud to show "To Hit" and "Damage"
Creepy fog from undead crypt altars. 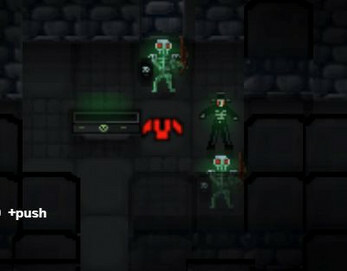 Added uberdroidgames.com and my name to HUD because I'm starting to see the game pop up in foreign game sites. Some AI fixes: Monsters will target each other now based on distance as well as faction hate. Better balance, cheaper starting weapons. Friendly Monster Banter system. They'll talk to you if they're your color. Click start instead of pressing space to start game. Holding space will now speed rest (but it's dangerous if there are monsters around). Small fix just made every 5th level a wide open dungeon with more altars. These are going to have more npc/npc combat and more unavoidable monster contact so be ready. v1.0.0.1 Little more balance and some mistakes fixed. Blob mouths were too tough. You now get EP from dropping gold in the grey altars.